Learning how to render walls is a useful skill. Changing and improving the exterior of your home is actually one of the most effective ways of adding value to your property, and new render is one of the cheapest ways of achieving this. You home’s exterior is the first thing that any visitors or potential buyers might see, so making sure it has got as much kerb appeal as possible is important, especially if the current exterior is in poor condition, or a mixture of different mismatched materials. Render can be sand and cement or a flexible, breathable polymer modified render for homes with solid walls. It can hide poor-quality or mismatched brickwork on period properties, and create a sleek finish on modern homes. It can come self-coloured or be painted later. Render works well with masonry or timber cladding, to add architectural interest, and can be matched with external insulation to warm up a draughty home. Find out how to render walls in this guide, and discover more ways to improve the exterior of your home with our essential guide. How much does rendering cost? External rendering using a sand and cement ‘scratch coat’ and a finer render topcoat, followed by two coats of external masonry paint will cost in the region of £40–£60 per m². Rendering and painting a typical three-bedroom semi-detached house with 80m² of walls would therefore cost £3,200–£4,800. For a solid walled house or where the cavity is too narrow to apply sufficient levels of insulation you may wish to take this chance to add insulation. In this case an external wall insulation system is usually a better option than insulating internally as no space or architectural detail is lost within the property. There are many different external wall insulation systems, but most of them are promoted on a supply and fix basis by specialists, so they’re not available to the DIY market. Applying external insulation with a render finish typically costs £70–£90 per m². A typical three-bedroom semidetached house would require 80m², so it would cost £5,600–£7,200. Use our guide to choosing and using lime mortar and render for a period home to find out more. Which type of render finish? Render can be applied to create a smooth, textured or patterned finish, and comes in a wide range of colours. Consider the type of render you use carefully – lime render with a textured or patterned finish will suit old, historic buildings, while new, silicone-based renders that are flexible, breathable, low-maintenance and smooth in their finish will suit contemporary homes. Modern renders are a big improvement on the concrete renders widely used until recently. Prices typically start at just under £60 per square metre. Lime render: Lime render is the best option for old homes. It is flexible and breathable so suited to period properties to alleviate damp problems. Cement render: This is the standard choice on external walls. It can be mixed on site and the materials used are cheap but as it takes two to three coats, labour costs soon add up. It does need frequent repainting to look fresh. Polymer render: Usually cement or lime-based, they have polymers and other plastics added to them to help prevent cracking. They can be through coloured meaning they don't need painting. Acrylic render: This is often used as a top coat over existing finishes. Silicone may be added for longevity and to prevent the need for cleaning. Monocouche render: Monocouche means 'single bed' or single coat in French and as expected this means only one coat is required. The product is based on cement render and comes ready to be mixed with water, then trowelled or sprayed on. Expensive to buy, but easy to apply you can recoup the material costs with reduced labour and maintenance fees. They are self-cleaning, won't crack and self-coloured so no need for painting. Love your daily dose of Real Homes? Then why not subscribe to our magazine for the amazing price of just £5 for five issues? Packed with fabulous readers' homes, trend features, project advice and easy updates, you'll wonder how you ever lived without it. Before a building is rendered, the walls should be surveyed, with repairs made to structural defects and any movement stabilised, otherwise the render finish is likely to fail. Any new finish is only as good as the wall behind it. External details such as bargeboards will often have to be removed, along with rainwater and soil pipes and other external details such as alarm boxes. Any vents will need to be extended, and sometimes window sills must be extended too. Metal stop and angle beads are then applied around the window and door openings and corners (or the edges of a terraced property) to provide clean edges for the render. The render system can then be applied. Where external wall insulation is being applied before the render coat, this is usually in the form of rigid boards or slabs. The type of fixing needs to be selected depending on the type of wall — which is either mechanically fixed or glued to the walls. A fabric render mesh is then applied over the insulation, bedded into the first base coat layer of render. This mesh acts as a reinforcement against cracking. This is followed by one or two more thin coats of render, usually a primer and a topcoat. Different proprietary systems are built up of different layers, using various forms of insulation, including expanded polystyrene (EPS), mineral fibre (Rock Fibre) and phenolic foam (more expensive but superior performance). Different types of render are also used with external wall insulation systems, depending on the application and the desired finish, including polymer cement, silicone and acrylic. Thin coat render systems are designed to be self-coloured so that they don’t need painting. As well as a choice of colours, different finishes are also available, from very smooth to textured. If you have chosen rendering that needs painting, make sure you choose a weatherproof external paint. Finally, the external rainwater and soil pipes etc. can be reapplied. You can expect the total process to take around three to four weeks. Do you need planning permission to render your home? 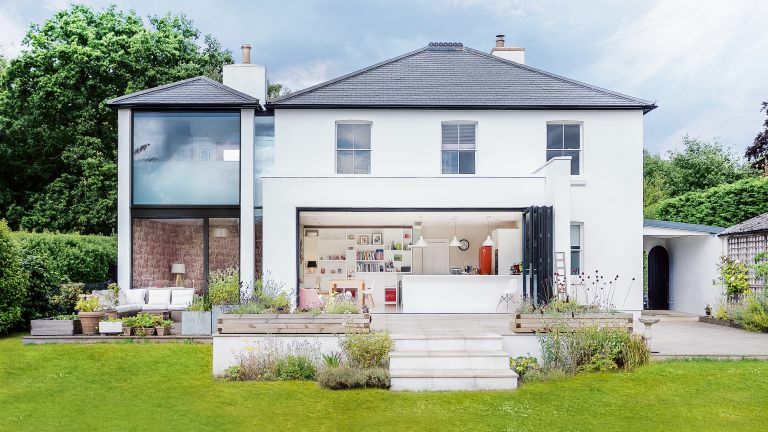 Planning permission isn’t usually required to apply render, providing the house isn’t listed or in a conservation area, and permitted development rights haven’t been removed (visit planningportal.co.uk and check with your local authority). Rendering work on a substantial part of a house must comply with building regulations. In an older house it is likely that the walls will have to be insulated. This will mean adding insulation within the cavity or, in the case of solid walls, by applying insulation on the inside or outside face of the external walls. It adds to the cost but reduces fuel bills by up to 40 per cent. DO check with a local estate agent that your plans will improve, rather than detract from, your home’s value. DON’T miss the opportunity to improve your property’s energy efficiency if you’re rendering your home. DON’T forget to keep some of your budget back in case you need to revamp the garden once the makeover is finished.